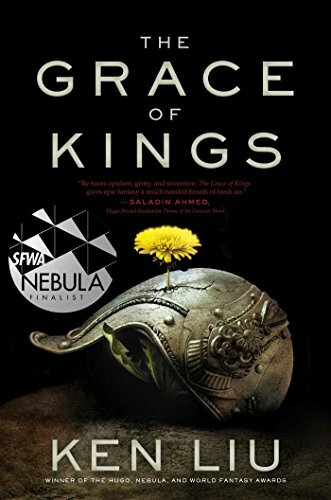 Ken Liu’s highly anticipated debut fantasy, The Grace of Kings, just came out this month, and he kindly answered a few of my questions about the book, and more! Also, we’ve got a copy of The Grace of Kings to give away to one lucky US reader, so be sure to fill out the widget at the bottom of the post! Congrats on your new book! I know that readers have been eagerly awaiting The Grace of Kings, but what inspired you to write it, and why epic fantasy? When I began planning for a novel, I wanted to come up with a story that would allow me to explore my interests in cultural translation and history. And that was how Dara was born. Dara would be a re-imagining of an old Chinese historical romance in the form of a modern epic fantasy. Epic fantasy is a genre that would provide a large enough canvas to tell the story I wanted to tell, and give me the space to explore the world’s cultures, peoples, and technologies in depth. I would be able to recast a foundational narrative for Chinese literature—the Chu-Han Contention—as a work of speculative fiction and also draw upon the tropes and narrative techniques embodied in Western national epics like the Iliad, the Odyssey, the Aeneid, and Beowulf. I wanted to create something that questioned the source material and delighted readers. Why do you think readers will relate to, and root for, Kuni Garu and Mata Zyndu? What secondary characters did you enjoy writing the most? Kuni and Mata are flawed characters whose ideals are shaped by their circumstances. They each want the world to be better, to be more just, but the meanings of abstract words like “justice” and “honor” are hard to pin down in a world that has moral complexities. I think readers will identify with the desire to do the right thing in a world that is not perfect, where we’re often forced to make decisions that we thought we would never make—and then justify them. As for secondary characters, I really enjoyed writing Gin Mazoti, a street urchin who grows up to be the most skilled battlefield tactician of her generation. I also have a soft spot for Kindo Marana, the tax-collector-turned-general—I was a tax lawyer, and I like the way Marana sees everything through the lens of his old profession. You’ve created an entirely new fantasy world, pretty much from the ground up, and have dubbed it “silkpunk.” Will you tell us more about the world of The Grace of Kings, and what kind of research you did for the book? In the end, I decided to create a new fantasy land that resembles continental China as little as possible, with a new mythology, pantheon, and set of languages, cultures, and peoples, but whose social and philosophical context clearly draw inspiration from Chinese and East Asian history. This was an attempt to estrange the story from its source as well as from the colonial gaze so that it could be perceived from a fresh perspective. To this basic worldbuilding frame I added a new technology-fantasy aesthetic I call “silkpunk” in which fantastical elements like vengeful gods and goddesses, giant water beast who bring storms, magical tomes that write themselves, and illusionists who literalize our fears are mixed with a new technology vocabulary based on organic materials (silk, bamboo, paper, feathers, coconut, coral, leather, ox sinew) and biomechanics, leading to silk-draped, feather-winged airships filled with women warriors, steam-driven underwater boats that move like whales, lodestone metal detectors, and giant battle kites that carry honor-bound duelists into the air. My research involved reading the source text from which I took the basic bones of the narrative (Records of the Grand Historian by Sima Qian), as well as a lot of research into the technology of East Asian antiquity and the historical development of airships and other machinery. It’s the pattern of technology evolution that I was interested in, and which I tried to apply in a reasonable way to the world of Dara. You employ an unusual narrative for The Grace of Kings. What made you decide on this type of writing? Since the novel is designed from the ground up to challenge assumptions embedded in Orientalism, I wanted to be sure that the narrative form also destabilized notions about East and West. So the story is told using a combination of techniques drawn from both the Chinese and Western literary traditions. For instance, the way POV is handled (omniscient and distant in parts, but with bursts of tight focus) may be reminiscent of works like Romance of the Three Kingdoms or wuxia novels, but the text also employs the epic voice or rhetorical devices like kennings and litotes where they feelright. I wanted to meld the two literary traditions I know the most about in an organic way that feels strange and familiar at the same time. When you started the book, did you have an idea of how it would end, or did you just let the narrative and characters take you where it would? I certainly knew the overall arc of the plot — this is a re-imagining of a foundational Chinese narrative, and so the spine of the plot was in place. But at the same time I wanted to make this series about continuous revolution and continuous challenge to the status quo, so I wasn’t bound by history. The trick, as always, is in working out the details, and I let the characters be my guide there. I’m, to a certain extent, what you would call a reluctant reader when it comes to epic fantasy, not because I’m not interested, but because often the sheer number of characters, etc, can be daunting. What would you say to a reader like me to get them interested in The Grace of Kings, and what other titles do you think newbies to epic fantasy might want to jump into? I tried to make the (potentially) overwhelming nature of the cast and setting somewhat manageable by introducing characters one at a time, and by giving each of them a backstory that readers can get into. Because the structure of the novel imitates a Chinese historic romance, much of the plot advances through “side narratives” that resemble self-contained short stories about individual characters. I think this can help readers ease into the world and get to know people as they are introduced. I also put a “dramatis personae” at the start of the book that should help with keeping track of who’s who until the characters are better known. Someone who might be intimidated by epic fantasy would do very well to start with Kate Elliott’s books. Elliott’s tales are massive and sprawling, but she keeps the focus tight on each individual character and makes it easy to care and root for them, even if there are many, many characters. Also, her worldbuilding is smart and deep, which I think is one of the greatest pleasures of reading epic fantasy. What authors or books have influenced you in your writing, and in life? I’d say everything I’ve read, fiction or nonfiction, Chinese or English, have influenced me to some extent. Even “guilty pleasure” books have taught me something about what delights readers. If I had to pick something a bit unusual, I’d say court opinions have been very valuable. Court opinions often have a “factual” section at the beginning where the facts of the controversy are recited in a supposedly neutral manner, but of course these facts are marshaled and organized in a way to support the legal justifications that come after. Studying these narratives have taught me a lot about how to tell a story in a way that compels a particular interpretation and conclusion. Working on the sequels to The Grace of Kings and some short fiction projects. I’m also finishing up the translation for book III of Liu Cixin’s Three Body series, which is fantastic, and possibly the most imaginative book in the series. Two men rebel together against tyranny—and then become rivals—in this first sweeping book of an epic fantasy series from Ken Liu, recipient of Hugo, Nebula, and World Fantasy awards. giveaway, interview, ken liu, The Grace of Kings.